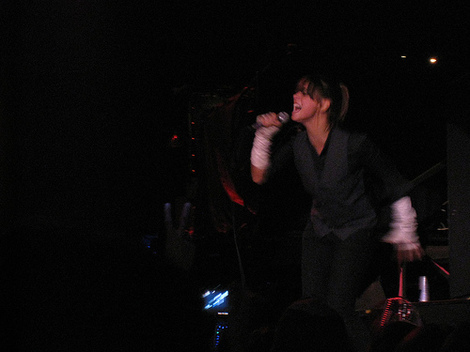 Went to see Cat Power last Monday night at First Avenue. Ms. Marshall was backed by the outstanding Dirty Delta Blues. I went into the show not knowing what to expect. I'd heard that she had been known in the past to have "outbursts" on stage. I'd also heard that she has pretty much gotten through that and has been putting on incredible shows. This show certainly fell into the latter. She definitely seemed a little uncomfortable/fidgety at times. She was constantly messing with the buttons on her shirt and ducking off to the side of the stage to grab a sip of Sugar-Free Red Bull while the band played out a chorus or section of a song. But she pushed through those moments and sang both her own songs and her own versions of other peoples' songs gorgeously. As with the covers, she sang her own material different than it sounds on the albums, which I really enjoyed. I have always admired her voice and it came through beautifully clear on this night. She was charming, sweet and as the night went on and she became more comfortable, engaging. While it wasn't the most energetic show you'll go to, it was more so than I expected and I'd go see her again in a second.